This 14-story tower has received national recognition for its extensive renovation as well as its resident service programs. The property features a large dining area, library, state-of-the-art fitness facility, computer center, and community garden. The top floor Resource Center sponsors daily activities and programs, including daily Sudoku contests, chair yoga classes, and monthly birthday parties. Its transportation assistance program helps keep residents active and connected – providing taxi vouchers for transportation to and from medical appointments. 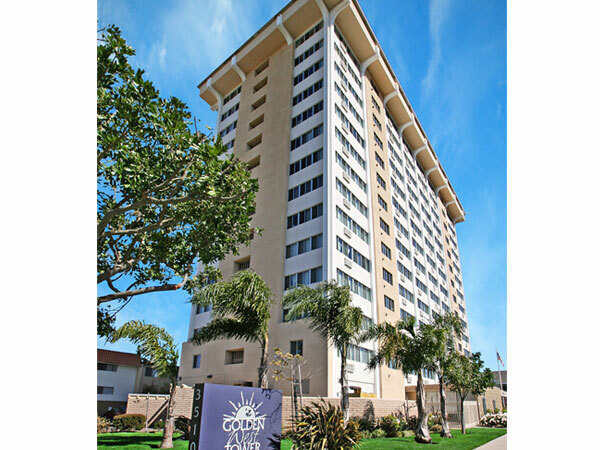 When we began the preservation work in 2005, Golden West Tower was a 33-year-old, 14-story senior housing facility located in earthquake-prone Los Angeles, California, and facing regulatory challenges from HUD. In need of extensive seismic renovation and other safety repairs, Vitus set out to generate sufficient funds for the retrofit using tax-exempt bonds and low-income housing tax credits. Drawing on a team of experts from across the country, our team was able to effectively make the case to HUD to allow the nonprofit owner to sell the property and retain the sales proceeds. This made the seismic retrofit possible, and the residents were no longer at risk in their own homes. Working with several partners, we were able to create a financial solution for a project that many said couldn’t be done. The completed property has since received national recognition for its extensive renovation as well as its resident service programs, and now features a full-time resident service coordinator, library, computer resource center, a well-used private garden, and an extensive social services program.